And so it was we set off. In the arms of a food guide who had taken around world famous chefs Anthony Bourdain and Joel Robuchon, we were glad we packed a good appetite that day. We started the morning at one of those places we all dream of having breakfast at but either can’t find or are too nervous to step in to. This tiny shoe box sized congee shop was packed to the rafters with locals slurping steaming hot congee and eating rice rolls. Dipping bread doughnuts into creamy, savoury congee and we were in heaven. We are huge fans of the dim sum lunch and our guide knew just the place. Up a rickety lift and hidden on the second floor we entered a bustling dim sum lunch room. Large tables with families, friends and strangers all eating together as a troop of raucous ladies paced the floor pushing their food trolleys. From mouth-watering scallops and fresh coriander dumplings to quail eggs, it was a food revelation. 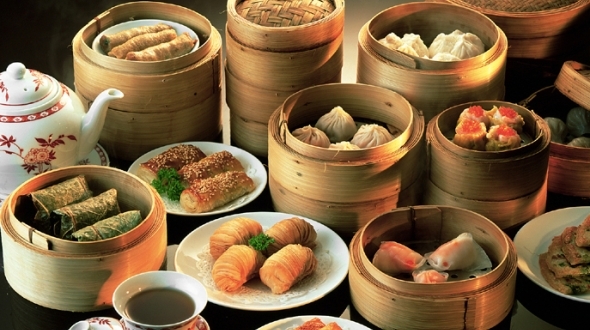 Hong Kong is one of the world’s truly amazing food destinations. From street stalls to Michelin starred restaurants, our food odyssey traversed from plastic chairs to fine dining. The key, of course, is knowing the best places to go which we can help you with! Contact us about the ultimate Seven Skies’ Hong Kong experience - a stay at the super stylish Upper House (read our review online here) with a Hong Kong food odyssey in the company of an expert resident food guide. Let your mouth water.